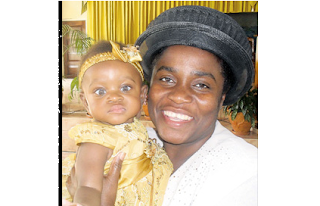 After 18 years of trying, on August 9, 2011, Andrea Thomas finally gave birth to her full-term baby girl, LéAndra. Today, words cannot describe the emotions that both Thomas and her husband Lengaw are feeling after having their child, whom they describe as a miracle. “I don’t think there is an adjective to describe how we feel. Each time I look at her I just say ‘because the Lord has heard and answered our prayer’,” the new mother said.